I met Pam through a mutual friend when I needed assistance with my little Boston terrier, Georgia Annabella Leigh. Little did I know then what a marvelous connection this would turn out to be for my mother, Dorothy, and myself. 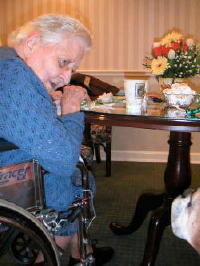 Mom suffered from Alzheimer’s disease and was living in a nursing home. Her first encounter with Pam and Reiki healing took place in the summer of 2005. Mom had been hospitalized for urosepsis (a condition where bacteria gets into the blood stream from a urinary tract infection, causing generalized infection). Urosepsis is very serious, especially in the elderly, and can cause death. Needless to say, my mother was very, very ill. After hospitalization, my mother returned to her nursing home, where she continued to be monitored. However, she was not bouncing back and looked to be slowly declining. My mother continued to be agitated, and because I had experienced Reiki healing myself, I asked her if she would like to have a “meditation” and explained a little about Reiki to her. (Although Reiki is not usually described in this way, my mother had difficulty understanding at this stage of her Alzheimer’s, and I knew that because of her Catholic background she identified with the concept of meditation associated with healing.) She immediately said yes and said that this would be comforting to her. So I called on Pam to provide a distance healing for my mother. As Mom had said, she wasn’t going anywhere, and she continued to progress and recover. One beautiful warm fall day the following year (2006), I was visiting my mother at the nursing home. We were outside in the nursing home park and I was giving my mother her customary wheel chair ride, which she loved. When we stopped to chat, Mom asked me, “Are you here to help me get into heaven?” I was stopped short for a moment. What do you say to a question like that? I asked Mom what was bothering her, and she said, “I don’t know what to say to God to get into heaven.” My response was, “Tell Him you’re Dorothy and that you did the best you could.” That seemed to make sense to her initially, but throughout the afternoon she kept bringing up the topic again and again. Obviously my simplistic response was not going to satisfy her. So I asked my mother if she would like to have another meditation and healing session. Her eyes opened wide, and she enthusiastically said yes. Pam shared Reiki with mother that evening. Pam’s note: During the session, which was conducted from a distance, Dorothy asked me what to do, what to say, in order to enter heaven. I told her to just open her heart. Like many others with Alzheimer’s disease, my mother manifested the symptom of repeating questions and forgetting past events, especially those most recent. What struck me about my mother’s Reiki healing is that she not only remembered the Reiki event (recent experience) but that she also stopped asking the repetitive questions that had prompted the Reiki healing. After this Reiki session, she never again raised the topic of getting into heaven. About two weeks before her death, on each of my almost daily visits, Mom would say to me that she wanted to go home but that she was reluctant to go because she would really miss me. Her insistence about “going home” made me believe that she was trying to prepare for this journey, but at the same time I knew that she was conflicted about this desire and about leaving me. On each of my visits, I would tell Mom that it was okay for her to go home, that even though she would miss me she had other things that she needed to be doing. Because of Mom’s consistent worry and confliction, I decided again to call on Pam for assistance. I asked Mom if she would like to have a meditation, and again her response was joy. On the appointed evening, Pam did a Reiki distance healing with Mom. Prior to the session, Merida explained to me that her mother had been a professional woman when Merida was a child. She had always respected her mother’s choices, as well as her independence and courage, but felt that the family had not voiced their support of Dorothy as much as they could have. While Dorothy was hospitalized with Alzheimer’s, Merida would often tell her mother how proud of her she was, what a wonderful mother and role model she had been. But Merida was concerned that her mother might not be hearing or understanding what she was telling her. When I began the Reiki session, your mother immediately said that she would be leaving soon. I felt it in my heart, and it brought a tear to my throat. I told her that her leaving was both sweet and sad. As I shared Reiki with your mother, I told her all of the things that you had asked me to share: how proud you were of her independence, courage, and spirit. Your mother’s energy was quite low to begin with, but it brightened as the session went on. Her energy was still very quiet, of course, but clearer, lighter. At one point, I saw a golden halo around her head. As her energy lightened, she said that she loves you, that you have always been a good daughter. She said that, while you may think she doesn’t understand you—because of her confused mind—she does understand you; her spirit understands. She said that it’s OK for her to be softer now. She can shed her rough exterior. She said that she will be with you always, “dear one.” She will light your way, like a candle on a dark path. She is very excited about where she is going, but she will never leave you. She understands now, is remembering, that she can be many places at once. She has loved her life in the body, but the idea of being free from her body is exciting now. She loves that you have your own business. She is very proud of your accomplishments. She thinks you are a magnificent woman. She wishes you every happiness. She wants you to remember that life is a game. It can be very hard at times, but you can never take it too seriously. I continued to share Reiki with your mother for a bit longer. Then we bid each other good-bye. Pam also told me that Mom was in transition and that it would only be a few more days before she went home. I had the privilege of being with Mom when she passed away a few days later, in December of 2006, just three months short of her 100th birthday. I was supported in my grief knowing that Mom not only passed away peacefully physically, but spiritually as well. And I have been comforted ever since in the knowledge that she is truly my guide, helping me every day to find my right path.